Even though investor sentiment was cautious in 2016, the year saw nearly 26 funds come into being. While many of them were maiden funds, quite a few of them were at their first or second close. 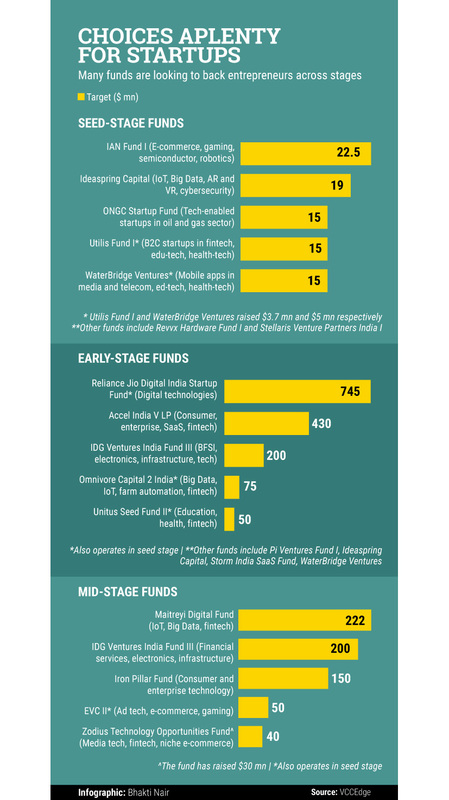 For startups looking to raise money in 2017, TechCircle.in has compiled a list of funds scouting for investments, targeting a total of $2.23 billion, as per estimates on VCCEdge, the research platform of NewsCorp VCCircle. There were 20 funds raised focussed on early stage deals, participating in Series A and Series B investment rounds. At this level, Accel Partners raised $450 million under a new fund in November, its largest India fund, to make seed and early-stage investments in Indian startups. The investment focus area of the new fund covers consumer, enterprise software, mobile and healthcare businesses. Another fund that was raised last year was IDG Ventures, which launched its third India-focused fund with a target corpus of $200 million. "In terms of investment strategy, we continue to focus on early stage technology companies across sectors including consumer tech and media, enterprise, health-tech and fintech," said Karan Mohla, partner at IDG Ventures. This was also the third largest fund raised in 2016. Seed stage (both seed and pre-Series A rounds) saw the second highest number of funds launched in 2016. Only six funds raised last year were looking to invest mid stage. Here, Maitreyi Digital Fund, floated by former executives from Aditya Birla Private Equity and Reliance Jio Infocomm, is the largest at $222 million. However, most of these funds were sector agnostic. The investor sentiment has also shifted to business models with less cash burn and clear path to profitability. "We are looking at asset-light, scalable [ventures], where the business model can become profitable with economies of scale," said Manish Khetarpal, founding partner at WaterBridge Ventures. The technology-focussed micro VC fund is looking to back ventures in sectors such as analytics, robotics, machine learning, digital finance, cloud/SaaS, and opportunities related to urbanisation. The $15 million fund has already backed three startups since its launch in August last year. Besides the funds mentioned above, Inventus Capital Partners and Kalaari Capital are also looking for investors for their third funds. 2016 also saw government bodies show active interest in technology startups. The government of Karnataka launched a GOK Startup Cell to implement startup initiatives and various funds such as Idea2PoC to back technology, agricultural and tourism start-ups, and KITVEN Fund (Karnataka Information Technology Venture Capital Fund) among others. A few of the funds launched specialise in certain sectors. The founders of healthcare private equity firm Quadria Capital have floated a $9.75 million venture capital fund called Healthquad to back health technology startups in India. In another instance, Revvx Hardware Fund would be looking to back hardware technology start-ups and has received soft commitments for over $5 million, while Storm India Fund has its eyes on only software-as-a-service-businesses and has raised $10 million for these investments.